Did the People Practice "Tsunami Tendenko"? 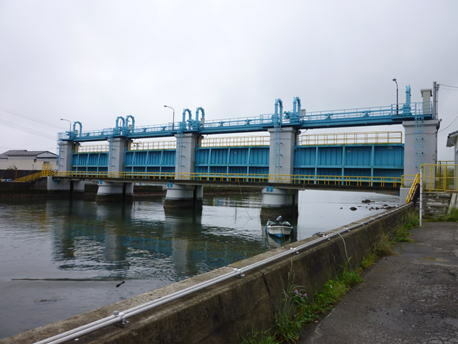 In the Sanriku coast, words "Tsunami Tendenko" have been handed down(Yamashita 2008). "Tendenko" is an idiom indigenous of this area. 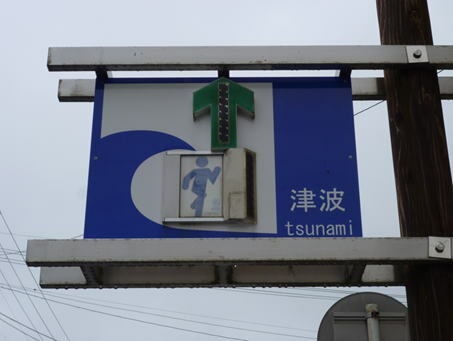 The direct meanings of these words are as follows; when you anticipate tsunami, each person should escape separately. However, these words include an additional meaning; by all means, run to a hill quickly, ignore even your parents and children; think only of yourself not to be sacrificed, and even if your parents die, no one should blame it. These words connote very sorrowful religious teachings, and vividly show that this area has been often attacked by huge tsunami. That is to say "Tsunami Tendenko" is sorrowful wisdom to avoid the worst holocaust. This photograph was taken at Shizugawa Senior High School. The Movie crip of the 3.11 tsunami attack taken from about the same position is here. 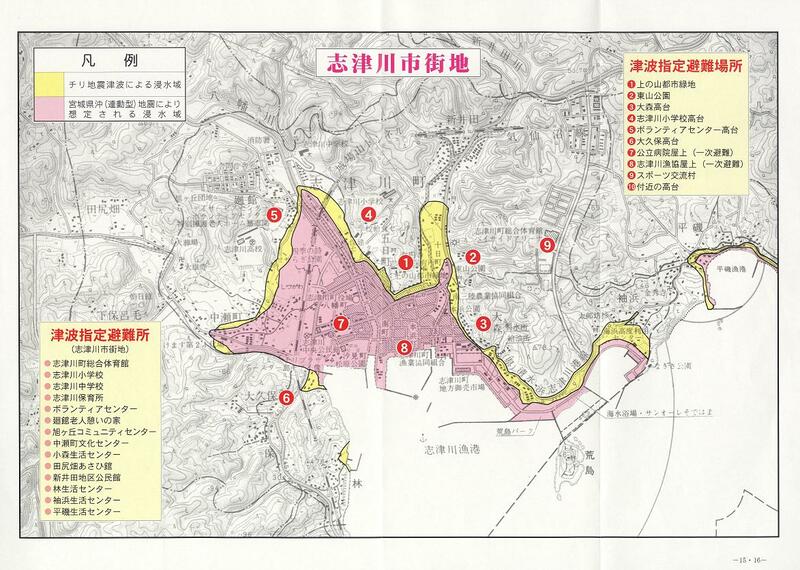 This report takes up Shizugawa area of Minamisanriku Town1). 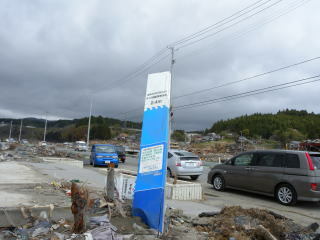 This is one of the municipality where the damage of the 3.11 tsunami had been most serious (Isoda 2011). 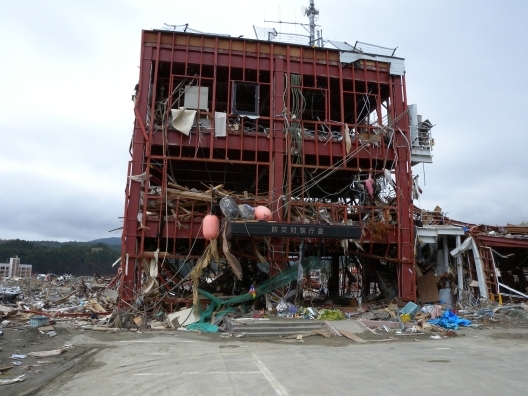 In the days of the beginning of the 3.11 great earthquake disaster, mass media reported that 10,000 people were missing in Minamisanriku Town, in a town of 17,430 residents (as of October 1, 2010). This news brought Minamisanriku Town into spotlight, but it became clear later on that it was misinformation borne out of confusion. This fact shows how administration of Minamisanriku Town was confused. According to the release of Miyagi Prefectural Police Headquaters, 519 persons died and 664 still missing as of June 1. Furthermore, we must be careful about the following points. Minamisanriku Town is a name of new municipality born in 2005. Until 2005, the northern part of this town was Utatsu Town, and central-southern part was Shizugawa Town. A mass media, in particular TV, often reports about "Minamisanriku Town". However, the majority focuses on ex-Shizugawa Town. We can make sure of this fact that inhabitants of Shizugawa area appearing on TV does not refer to the location as "Minamisanriku Town". This report aims at the reality of the attack of the 3.11 tsunami and elucidation of the present of evacuees in Shizugawa area. Table 1 is a list of major tsunami after the Meiji era. Sanriku coast is the area that has been often attacked by tsunami. In particluar, approximately one year ago, the 2010 Chile earthquake occured and large-scale tsunami warning was issued. Tsunami that time was 1.3m high in Shizugawa area. 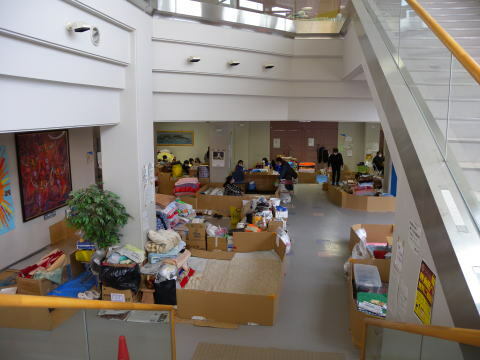 The inhabitants of Shizugawa area experienced evacuation routine from tsunami approximately one year ago. There was no victim and injured person then. In addition, it had been predicted that Miyagi earthquake accompanying tsunami would happen surely in the near future. Therefore, in the Shizugawa area, advanced countermeasures for a tsunami was prepared (Hayashi and Aoki 2011). It is not contained within a tsunami barrier and the maintenance of the refuge place. 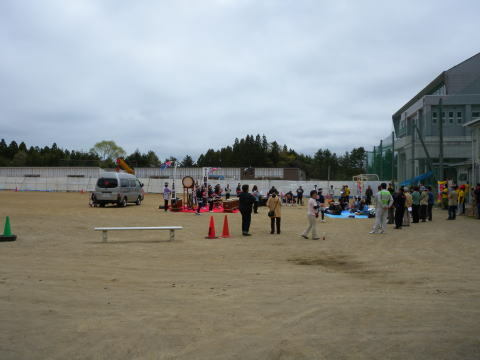 The education of the disaster prevention to inhabitants was carried out seriously, too. And inhabitants made voluntary disaster prevention organization in every neighborhood association in 2006. The 3.11 tsunami attacked the advanced area of the tsunami disaster prevention, and many people were sacrificed nevertheless. Many Japanese receive a big shock from this fact. Anyway, the trust to earthquake and tsunami prediction was spoiled widely. Fig. 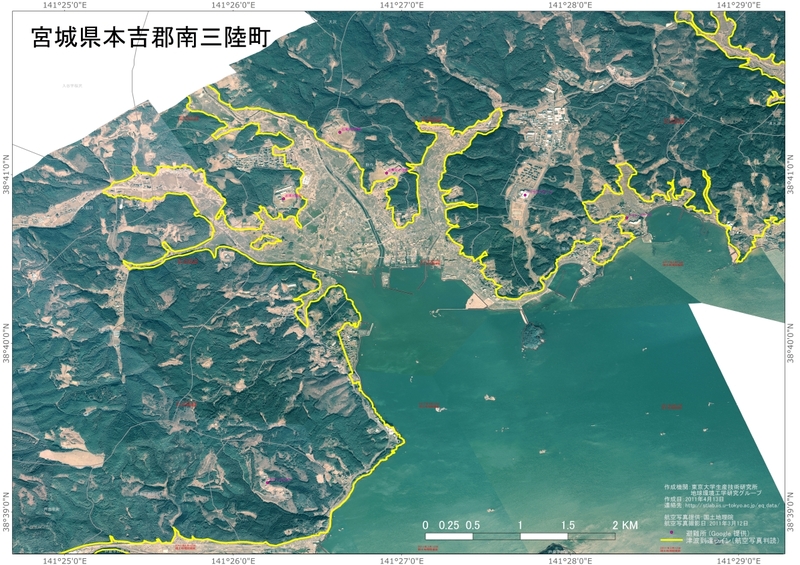 1 is tsunami hazard map of Shizugawa area. The yellow part shows inundated area of the 1960 Chile tsunami, and the pink part shows expected inundation from the (then forthcoming) Miyagi earthquake. This hazard map was distributed to all households. In this area, hills around the built-up area were composed with the specified refuge place in case of the tsunami. Public utilities are located on the hill including schools. Number 7 is public hospital (Photo 4), and Number 8 is a 4th-floor building of the fisheries cooperative association (Photo 5). Both are buildings of a steel cage or a steel reinforced concrete construction. Solid buildings located near coast such as number 7 and number 8 were specified as "the primary refuge place" i.e. when an earthquake occur, the inhabitants near the coast were to evacuate to such buildings in the scheme. It was assumed that inundation area from the forthcoming Miyagi earthquake would be smaller than the 1960 Chile tsunami. 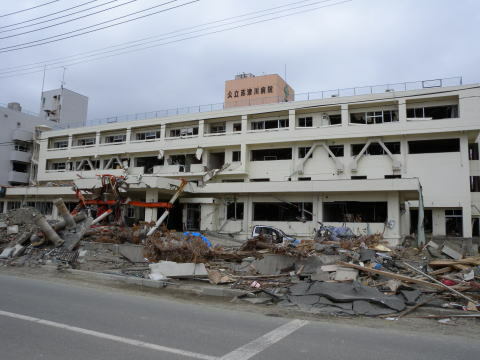 The 3.11 tsunami destroyed these buildings one and all this time. Fig. 2 is the area that the 3.11 tsunami attacked. The 3.11 tsunami arrived at from coast to the yellow line2. Source: Earth environment engineering research group, Institute of Industrial Science, The University of Tokyo. 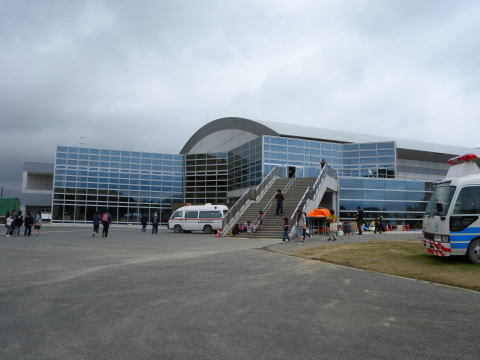 The governmental building of the Minamisanriku Town which was becoming obsolete, and it was thought that the building would not withstand the anticipated Miyagi earthquake and tsunami attack. 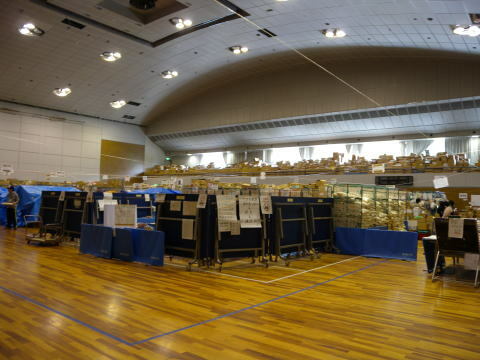 Therefore a interim governmental building for anti-disaster measures was constructed (Photo 6). The government set up the specialized post which took an emergency management called "Crisis-Management Division" there. 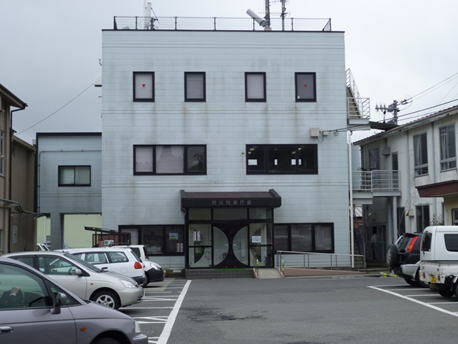 However, this building has received fatal damage in the 3.11 tsunami, and was flooded to the roof, and a lot of staffs of the municipality were sacrificed (Photo 7). Lost lives are those of who supposed to lead the restoration after the disaster. The administrative function was thereby paralyzed widely. 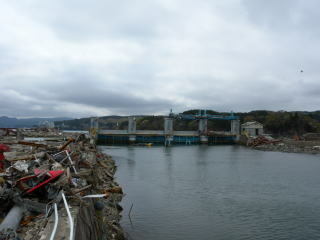 The water gate of the estuary of the Hachiman River passed at the center of the built-up area was destroyed (Photo 8). Sign posts indicating the tsunami height of 1960 Chile tsunami were set everywhere of the town, but are destroyed one and all (Photo 9). However, among refuge places located on the hill, only one place had been attacked by the tsunami. It is welfare facilities for the aged (number 5 in Figure 1). 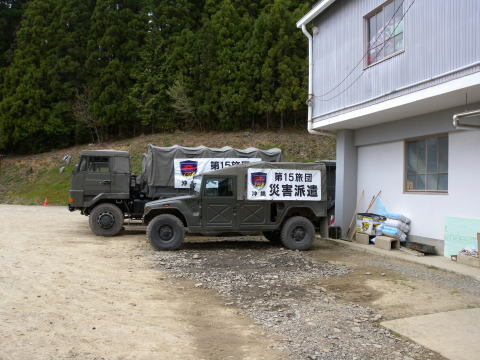 That is to say, not all of the refuge place was not attacked in Shizugawa area by tsunami. In refuge places except number 5, 7 and 8, most evacuees survived. Number 5 was on the hill but was slightly lower than others. In other words, it was important that inhabitants evacuate to the location of higher altitudes as possible. After all, the religious teachings of "Tsunami Tendenko" were correct. The Minamisanriku general gymnasium located on the hill is still used as a shelter (number 9 in Figure 1). Evacuees live in the divisions that partitioned off using corrugated cardboard allocated to every family(Photo 11). In addition, a large number of tents are pitched around the building (Photo 12). 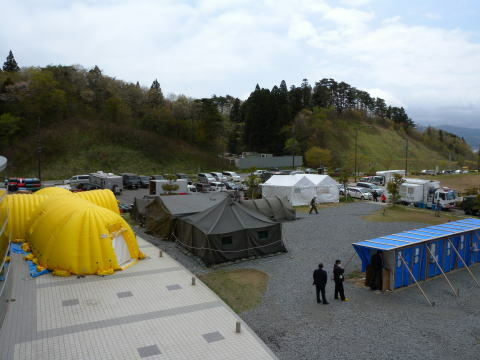 Japan Self-Defense Force searching the missing person and many volunteer teams of medical support use these tents. They bring tents not to take space from evacuees. In May, the shelter turned to be a place to store mass relief supplies. 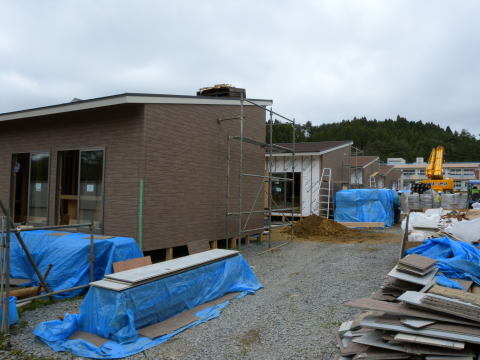 Photos 14 to 17 is the shelter at Shizugawa Senior High School. An event to cheer up the evacuee is often held there. In addition, the construction of the temporary house for evacuees begins in school ground (Photo 16). However, the problem that an evacuee does not enter in a temporary house happens, because when an evacuee moves to a temporary house, food that had been free at the shelter would no longer be distributed. In addition, it costs electricity bill, gas charges, water service charges at temporary house. 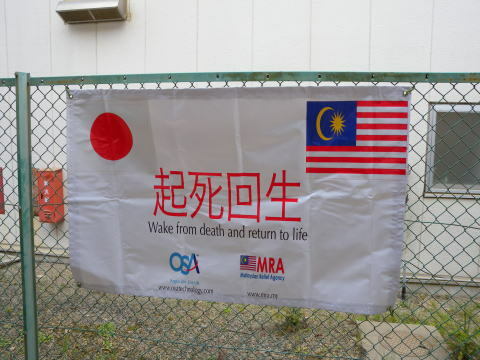 For evacuees who lost both the house and the work by tsunami, the burden is extremely heavy. A deep human relation in the shelter is broken in the temporary house. In the case of the 1995 Hanshin Awaji great earthquake disaster, the lonely death of elders in the temporary house occurred frequently. After an evacuee moved to a temporary house, they need multifaceted and continuous support. This unit is dispatched from Okinawa Prefecture. People dance with a Japanese drum. 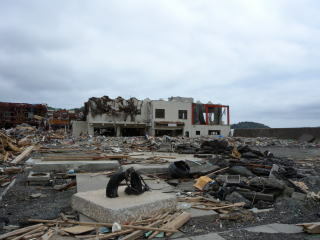 The basic life of inhabitants is not restored in Shizugawa area, even a lifeline is non-restoration. The tap water cannot be used in particular because water source was attacked by tsunami, so salinity is high. Many inhabitants whose houses were not damaged continue to suffer this damage. The disposal of large amount of debris has not made muchprogress, too. We realized that tsunami was the disaster which destroyed the life of inhabitants completely. The 3.11 tsunami highlighted the basic problem of "Safety of the location" that we lived. Most people in Shizugawa area kept religious teachings of "Tsunami Tendenko". In the case of the 3.11 tsunami, the location of many refuge places were appropriate to some extent. It is rather more correct to see that many victims died because they were not able to succeed in escaping from tsunami, and the fundamental cause will be the aging of the Sanriku coastal area. The majority of the victim of this disaster is more than 65 years old3). There is the indication that there had been a problem on the way large-scale tsunami warning by the Japan Meteorological Agency were issued. Photo 18 is broadcast of 15:03 on March 11 on the NHK television. 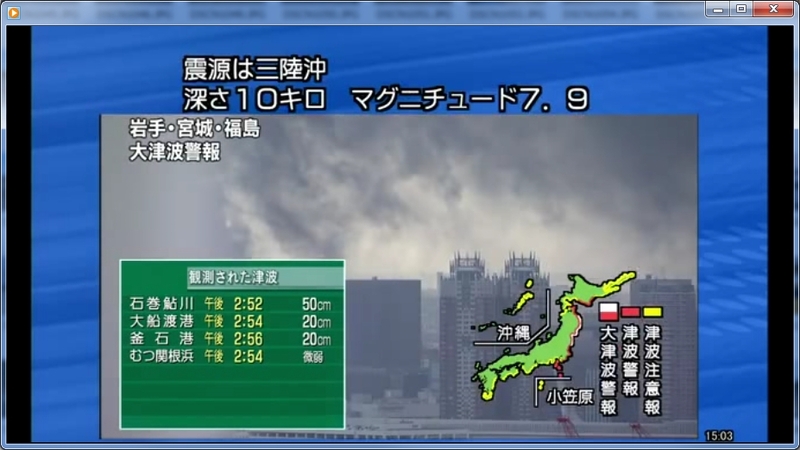 This shows that it observed tsunami was 50cm in height in Ayukawa, in Ishinomaki City located the just south of Shizugawa, and 20cm in height in Ofunato City located just north of Shizugawa at this time.This information was broadcasted on the radio, too. With this information, the people might have felt relieved, and there might be many victims who failed to get out in time. (However, a large-scale blackout happened just after earthquake, and many people may not have watched or heard this information). Why were so many people, particularly elderly, were not able to arrive at the refuge place? This question includes an extremely geographical problem. You may see it as totally destroyed, but still doing business. The locations of photos in Shizugawa area can be viewed from here. Movie clips of Shizugawa area can be viewed from here. 1)This report and observation are based on S. Sasaki 2010. 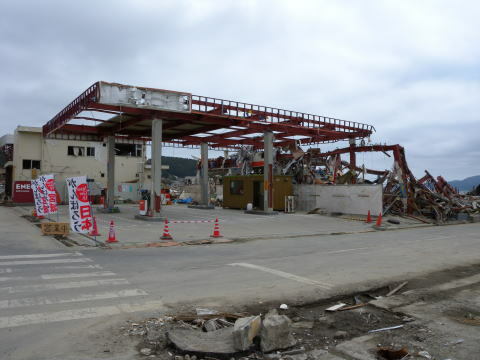 Local Disaster Prevention Judging from Consciousness and Evacuation Behavior about the Tsunami On ex-Shizugawa Town in the 2010 Chile Earthquake Tsunami, graduation thesis, Division of GeoEnvironmental Science, the Department of Earth Science, Tohoku University (in Japanese). Various organization and companies try making them elseware. Refer to links for the details. Yamashita, F.(2008): Tsunami tendenko: Kindai nihon no tsunami shi (History of Modern Japanese Tsunami). Shin Nihon Shuppansha, Tokyo. (in Japanese) ISBN978-4-406-05114-9.